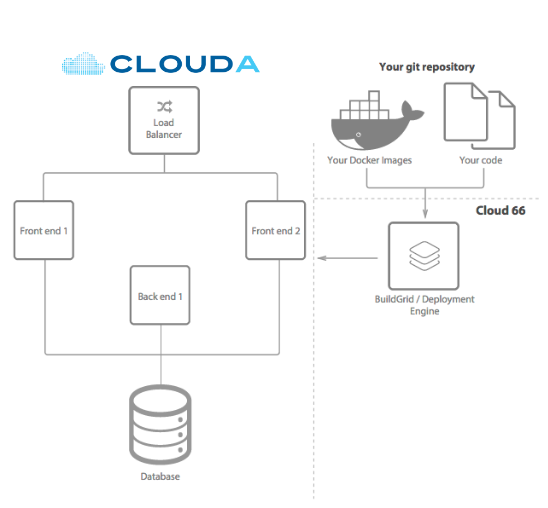 Cloud 66 connects to your git repository, reads and analyzes your application source code and builds and configures the components that are used in your application on your own servers on any cloud. Roll out your Docker containers to all of your servers and manage their lifecycle with graceful shutdown, traffic draining and seamless switch-over. All web traffic to the containers is distributed with local Nginx deployments and can be accessible to the public on your selected ports on HTTP or HTTPS. Dedicated background servers or shared ones with your Web Servers power all the background jobs you might have. Scale them vertically or horizontally, manage the workers' lifecycle (draining, graceful or forceful shutdowns and job rollovers) and pin or move the workers to specific servers. Starting from your source code or Docker images, your servers are started, configured and application containers are started up on each server. Web traffic load balancing, container lifecycle management and background processes are done automatically with each deployment and can be managed through the UI, command line or the API. Your databases are built and deployed on your own servers and are managed, while setting up backups and replication is a couple of clicks away. Deployment: Start from your code and roll out throughout your cluster. They can be triggered manually or automatically after each code commit. Monitoring: CPU, Memory and Disk are monitored on all servers. Your application processes are monitored and restarted if needed and OS is updated automatically. Backups: All databases are built and configured on your servers but managed and backed up off site. Replication: Replication is supported for MySQL, PostgreSQL, Redis and MongoDB and ElasticSearch.